Firstly, it is important to note that Pauling was apparently not aware of the absolute handedness of amino acids (which are (S) in CIP terminology). This had in fact only been established a few months before Pauling’s publication by Bijvoet, and news of this might not have reached Pauling. So Pauling guessed (or perhaps, he had already built his models, and did not have time to reconstruct them) and his famous α-helix diagram turned out to be the enantiomer of the real McCoy. As with DNA itself, the helix bears a diastereomeric relationship to the chirality of the amino acids; both have to be inverted to get the proper enantiomer (which is what Pauling did). 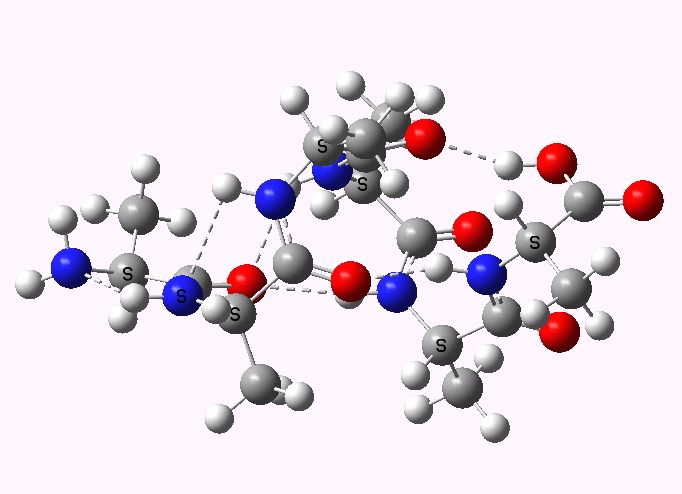 The secret that Pauling had discovered was hydrogen bonding, and particular, weak N-H…O=C interactions (Wrinch had thought it was strong covalent N-C-OH bonding instead). Of course, there are other effects at work, which include van der Waals or dispersion interactions, electrostatic effects resulting from the large dipoles in peptides (not least due to the zwitterionic character), the planarity of the peptide bond itself, the potential for other types of hydrogen bond (e.g. C-H…O) and entropic effects. I have split some of these down for left and right handed forms of DNA in another post. It turns out calculating most of these effects on an even-handed basis is not that easy. Only the recent advent of dispersion-corrected DFT procedures, together with solvation algorithms that allow for accurate geometry optimisation and subsequent evaluation of free energies allows such a calculation to be performed. 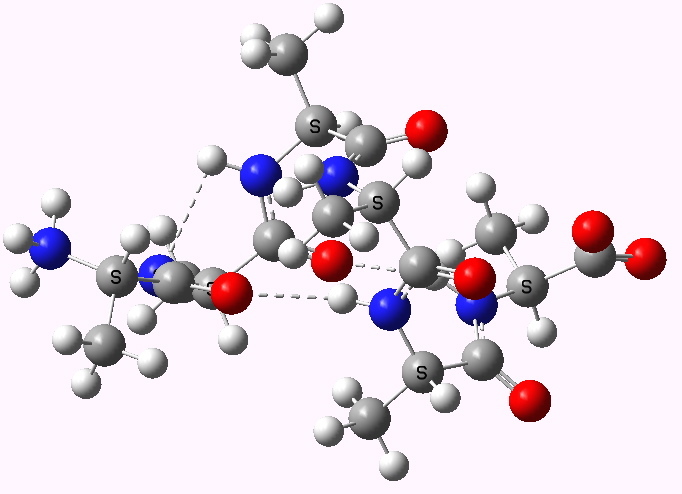 Hitherto, it has been mostly molecular mechanics that has been used (which itself relies on many parameters from quantum mechanics, such as atom charges, and explicitly identifying interactions for hydrogen bonding). By returning to a quantum-mechanical model, some of these assumptions inherent in the mechanics method need not be made. 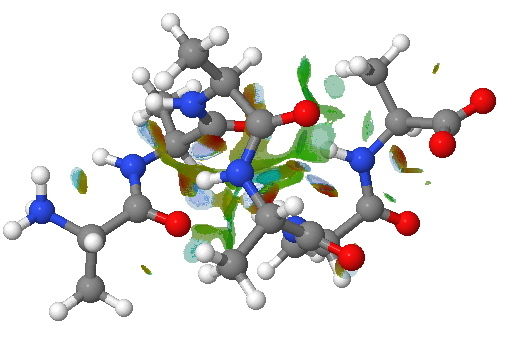 We showed in 1991 that an effective solvation treatment required for the zwitterionic form of amino acids in aqueous solutions would ideally comprise not only a self-consistent-reaction-field, but also explicit water molecules as solvent. 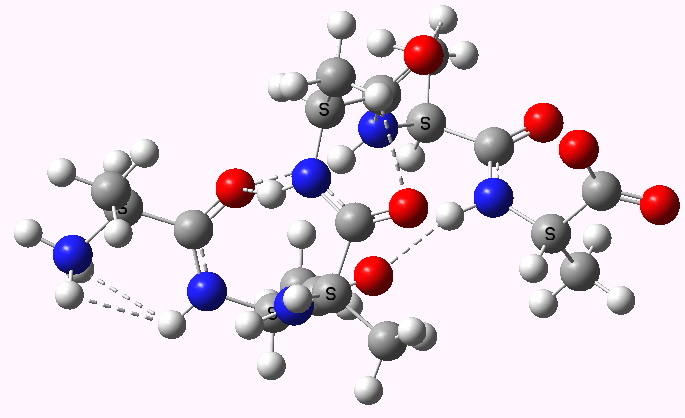 Here only the former solvation term is included, but expanding the model to include water is certainly possible. 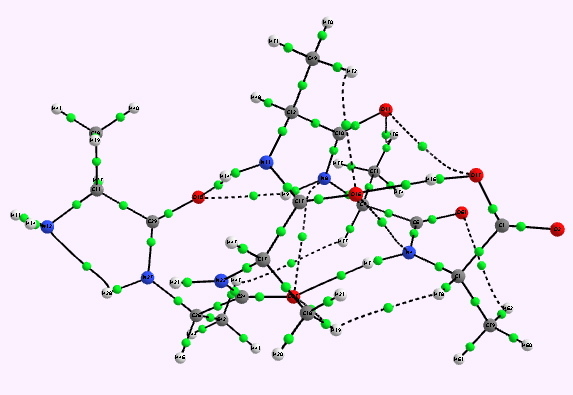 Both the zwitterionic and the neutral forms of (ala)6 are included below, so that the effect of a large dipole on the structure and relative helical stability can be estimated. One notes that (even in a dielectric cavity corresponding to water), the extended zwitterions are high energy species. In a protein, they of course would be stabilized by the immediate environment of the ions. The right-handed helix clearly comes out as more stable (by about 1 kcal/mol per residue, see also DOI: 10.1021/ja960665u), but this is not really due to either dispersion effects or entropy and must therefore arise largely from the hydrogen-bond like interactions. Ionizing the termini to form a zwitterion increases the propensity for a right handed helix slightly. Shown below are the calculated structures. 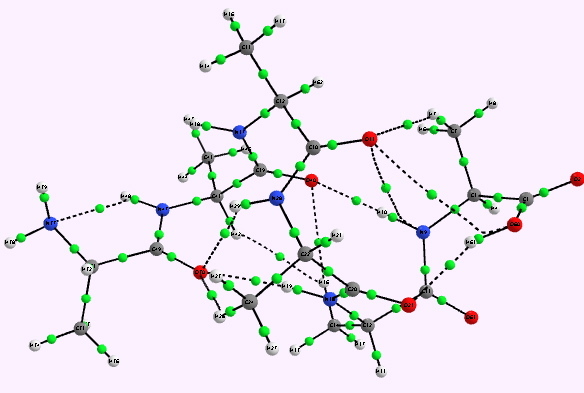 The chains have (inter alia) unusual bifurcated hydrogen-bonding interactions, between one carbonyl group and two N-H groups (show as atom with halo). These are not quite the models that Linus Pauling built! For a more objective analysis of the interactions within the system, a QTAIM analysis is shown below. Left helix. Bond critical points in green. Click for 3D. Whilst the overall conclusion is that theory agrees well with the experimental observation that peptide sequences tend to coil into right rather than left handed helices, the reasons they do so is a little more subtle than simple model building alone can reveal. As the AIM shows, a plethora of unusual and weaker interactions occur within these helices, a full analysis of which must await presentation elsewhere. 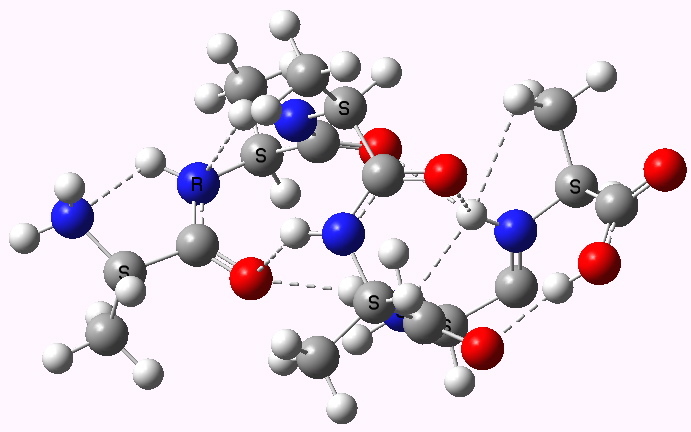 An NCI analysis reveals strong hydrogen bonds as blue-shaded surfaces. NCI surface. Click for 3D. This entry was posted on Saturday, April 9th, 2011 at 4:26 pm and is filed under Interesting chemistry. You can follow any responses to this entry through the RSS 2.0 feed. You can leave a response, or trackback from your own site. In DOI: fdw4k6 they concluded that just 31 out of 7284 proteins displayed LH alpha helices (of >4 aa’s in length), or just 0.4% in total! To which I add a hugely approximate estimate of the average relative energies. Taking a ratio of 7284/31 and converting to a free energy difference, one gets ~ 3.2 kcal/mol. This of course has to be normalised against the chain length.